October was a bit crazy. I haven’t posted about it, but we had to re-home Pablo earlier in the month, due to severe separation anxiety. We were both devastated, but we knew he would be happier, and safer, in a home where someone would be there at all times, and with other greyhounds. We’re hoping to adopt a senior dog after the holidays! Make progress with my Lady Lounge. — Accomplished! Write at least 500 new words for my WIP. — Did not accomplish. Prepare for NaNoWriMo 2018! — Accomplished! Get together with several friends. — Accomplished! Finish reading my current book. — Accomplished! Donate items to Project Beauty Share. — Did not accomplish. Donate blood. — Did not accomplish. Small victories. I cleared out a few more boxes. There’s still more work to do, but I call my small efforts progress. I barely opened my laptop this month. We enjoyed the Halloween party at Kathryn and Tim’s house on the 20th. I have the box all ready to go, but never made it to the post office. My iron was too low. But, it was higher than my iron was in August. I feel confident that I will be successful in December. We didn’t decorate much this year, but handing out candy is always fun. I was able to put Accomplished next to five out of eight goals. Yay! The three goals I did not accomplish: There’s always next month! What about you? Did you have any goals for the month of October? Come back tomorrow to see my November Goals! After four years of not participating, I decided I wanted to commit to NaNoWriMo 2018! After my success with both Camp NaNoWriMo sessions earlier this year, I wanted to try the November event again. I’ve also published excerpts of my most recent NaNoWriMo attempt from 2014. I’ve dropped a few hints, here and there, about an idea I’ve had percolating for a fourth novel. So, for NaNoWriMo 2018, I want to finally put my fingers to the keyboard and start fleshing this out! Synopsis: On her way to her milestone birthday party, Nicole, a dedicated Newport News, Virginia police officer, gets stuck in traffic at the Monitor-Merrimac Memorial Bridge-Tunnel. As the tunnel stoppage unfolds into a true mystery, Nicole finds herself reflecting on her career, family, friends, acquaintances, and the criminal justice system. Can she help solve the mystery in one night? I’m excited to dive into Nicole’s world, and help tell her story! What about you? Have you ever done NaNoWriMo? Come back around the beginning of December to see my results! The ABC Book Challenge: you must be Joking! Written by Katherine Paterson, author of Bridge to Terabithia, this is a great historical fiction novel. Roald Dahl is one of my favorite authors. If you haven’t seen the movie adaptation (1996), I highly recommend it. It took me a long time to be able to digest and appreciate Jane Austen, but Jane Eyre is one of her books that hold a permanent place on my shelves. I resented reading this in high school as assigned reading. I actually want to re-read it at some point. Chris Van Allsburg is another one of my favorite authors. The movie adaptation (1995) is one of my all-time favorite movies, and the recent sequel (2017) was also, surprisingly, well-made. Sarah Dessen was a defining author throughout my high school and college years. I’m pretty sure this book is one of the first of hers that I read. I want to read more from Daphne du Maurier! I’ve seen the movie (1975), but I want to satisfy my curiosity by reading the book. I was very intrigued by the synopsis of this one! I love collecting the Dear America and My Name is America series! Same story. I’ve seen the movie (1993) and sequels (1997, 2001, 2015, 2018), but I’ve never read any of Crichton’s work. I’ve read quite a few books by Susan Beth Pfeffer, but I don’t remember reading this one. Hopefully my library will have it. What books have you read, or want to read, that start with the letter J? Let me know! 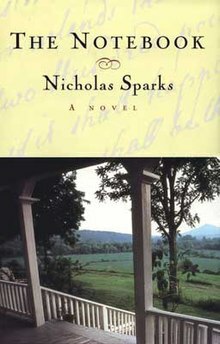 Nicholas Sparks was my absolute go-to for romance novels for a long time. I own nearly every one of his books, and he was a defining author for me for several years. In fact, I did my college senior thesis on his books. I studied the perceptions of love and romance from female readers. I would like to eventually publish it! Born on New Year’s Eve 1965, Sparks was the second of three children. The family moved frequently while his father was pursuing graduate studies in Minnesota and California. Eventually, they settled in California after his father became a professor. On a track and field scholarship, Sparks majored in business finance at Notre Dame. He married Cathy Cote in 1989, and they have had five children, three sons and twin daughters. He started writing in his early college years. His first publication was as a co-author in 1990. The book was titled Wokini: A Lakota Journey to Happiness and Self-Understanding. While selling pharmaceuticals in the early 1990s, Sparks wrote The Notebook. Literary agent Theresa Parks offered to represent him after finding it in her agency’s slush pile and liking it. She secured a $1 million advance from Time Warner Book Group in 1995. After its publication in October 1996, it made the New York Times best-seller list in its first week. He lives in New Bern, North Carolina, where he donated $9 million to New Bern High School for an all-weather tartan track. He and his wife amicably separated in 2015, and subsequently divorced. As of October 2018, he has published 22 books. He has published one book nearly every year since 1996, with two books being released in 2003, as well as 2005. Eleven books have been New York Times best-sellers. His most recent book is Every Breath. I honestly can’t remember if this was truly the first Sparks book I read. But, I loved it, and the movie adaptation (2002) was very good. It was also incorporated into some of our Sunday School classes and youth group activities. 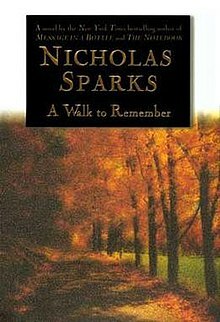 I think I read this after the movie adaptation (2004) came out, but this is one of Sparks’s books that I treasure and re-read frequently. The movie adaptation is one of the best that’s ever been made, hands down. 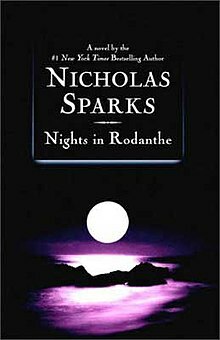 I felt a special connection with this book, since Rodanthe, North Carolina, is only about two hours south of where I live! I wanted to love the movie adaptation (2008) so badly, especially since I’ve visited the house that’s featured in it multiple times, but it wasn’t that great. This book was a hard read for me. I myself was a part of an abusive relationship for several years, and this book brought back several memories. Thankfully, by the time I actually read it, I was several years into dating Al. I’m pretty sure we watched the movie adaptation (2013) together. I liked it a lot, despite the subject matter. I waited for what seemed like FOREVER to get my hands on a copy of this from the library! I devoured it on a car trip either to or from Florida. Most people hated / loathed the movie adaptation (2010), but I liked it. What about you? 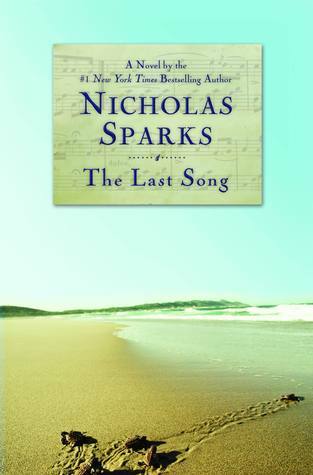 Have you read or seen any of Nicholas Sparks’ work? So, my current total is 18 books. Karina Bartow asked me months ago to be a part of her blog tour, and I happily agreed! I chose to review her new book Forgetting My Way Back To You. It was just released yesterday – October 15th – but Karina was nice enough to send me a PDF to read in advance. Thanks, Karina! Many of you know that I prefer physical copies of books to e-books, but I made an exception in this case. My eyes were a bit blurry once I finished, but I enjoyed the story. It’s not a super-long book – The PDF was roughly 218 pages. However, it has been a LONG time since I’ve touched a book that was a love story / romance. I liked Charlee from the beginning. I recognized several themes from the first few pages – Perseverance, determination, and grit. She’s been through a lot in a few short years, between her own struggles, and her family dealing with a serious illness / setback. I was very skeptical about Hunter. I wasn’t sure if I could trust him, or not. I think other characters had that vibe, too. However, I feel like the skepticism was a benefit to the story. It kept me interested. Considering I flew through the first 17 pages in less than 20 minutes, and then I read pages 17-58 in just thirty minutes during one of my lunch breaks, Barlow’s writing kept me engaged and interested. My husband thinks I broke a speed record with how fast I read this book! The one plot point I had a significant issue with (no spoilers, I promise) was integral to the story, but it definitely made me roll my eyes and groan a little. Having that situation happen to Charlee was a bit cheesy, I’ll admit. I told my husband what happened in the story – I was reading next to him on my iPad while we were relaxing one night after work – and he had a similar reaction. Despite the slight cheesiness, I really enjoyed this book. I loved the characters and their interactions. The dialogue was well-written, and it was really easy to follow along and lose myself in a book for a while. The Pennsylvania setting was picturesque, and she captured it so well! I look forward to reading more of Bartow’s work! Make progress with my Lady Lounge. Write at least 500 new words for my WIP. Get together with several friends. Finish reading my current book. Donate items to Project Beauty Share. There are way too many boxes in there! I need to dedicate some time every weekend to make it less cluttered. I really want to close out this draft! November will be here very soon! I’m excited to write something completely brand-new! We are planning to spend some time with our friends Ashley and Ray, and their son, Adam. We’ve also been invited to Kathryn & Tim’s annual Halloween party! It’s a really interesting story, and I’m looking forward to finally writing the Book Review! I discovered this Washington-state-based organization through a recent advice column. I want to clear out some unused beauty products, and help others! The next blood drive is Saturday, October 6th! We’re excited to pass out candy to the trick-or-treaters. We love seeing their costumes every year! Do you have any goals for the month of October?